Jurors in the sentencing retrial of a man facing the death penalty for carjacking and killing two Massachusetts men have listened to an audio recording of part of the man's confession. Prosecutors played the audio Wednesday during the trial of Gary Sampson. Sampson pleaded guilty and was given the death penalty in 2003, but a judge later granted him a new sentencing trial. 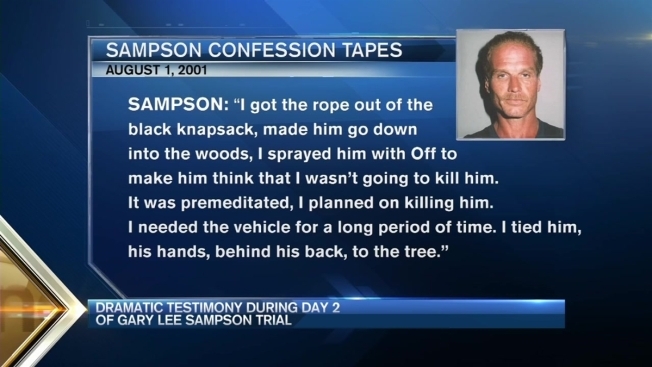 In the recording, Sampson said he returned to his hometown of Abington, Massachusetts, in July 2001, with the intention of killing the town's police chief. When he couldn't find him, he started walking, then hitchhiking. He said that's when he got a ride from his first victim, 69-year-old Philip McCloskey. The families of Sampson's victims sat quietly listening to gruesome details about the killings. Testimony is set to resume Thursday.